Charjabug in game: 267 Who? Important notice! Pokemon Charjabug is a fictional character of humans. Charjabug (Japanese: ????? Denjimushi) is a dual-type Bug/Electric Pokémon introduced in Generation VII. It evolves from Grubbin starting at level 20 and evolves into Vikavolt when leveled up in a special magnetic field. 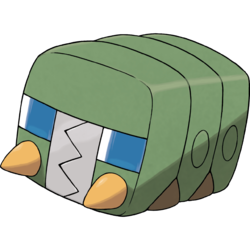 Charjabug is a small, cuboid Pokémon resembling an insect. Its body consists of three square segments with two brown stubs on each side. The last two sections have a thin, ring-like marking on each side. Its face has square blue eyes, which sometimes have sweeping green lights inside. Two short, yellow spikes extend from the front square: one on each side of its rectangular mouth. The mouth itself is gray and has two jaws that close sideways, shaped like a lightning bolt when open. Charjabug creates and stores electricity in its body by digesting food. This energy is stored in an electric sac. The electricity it stores could run a household for a whole day, and can be shared with other Pokémon. This Pokémon stays immobile as it prepares for its evolution, and is often half-buried in the earth. Its body is capable of storing electricity. On camping trips, people are grateful to have one around. From the food it digests, it generates electricity, and it stores this energy in its electric sac. Moves marked with a superscript game abbreviation can only be bred onto Charjabug in that game. Charjabug is the only Pokémon with a signature Ability that loses it upon evolving. Charjabug, along with its evolutionary relatives, were designed by Hitoshi Ariga. 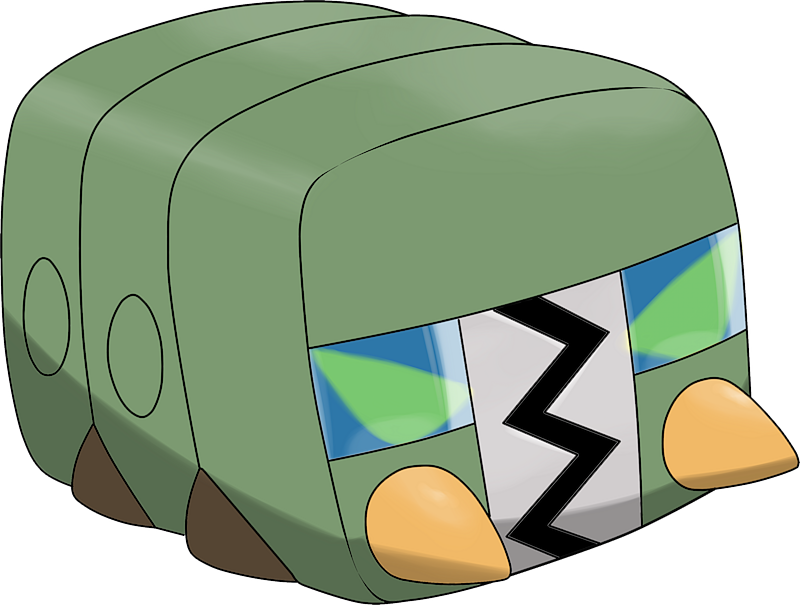 Charjabug appears to be based on a cocooned bug and a battery. It may also be based on the Denkimushi, a caterpillar in Japan that, when touched, can give a sting that is said to feel like an electric shock. Based on its cry, it may also be inspired by an accordion. Charjabug may be a combination of charge (as in to charge a battery) or charger and bug. Denjimushi may be a combination of ?? denchi (battery) and ?? jimushi (grub).